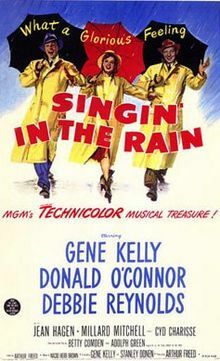 Singin in the Rain is a 1952 American comedy musical film starring Gene Kelly, Debbie Reynolds, Donald O'Connor and Jean Hagen and directed by Gene Kelly and Stanley Donen, with Kelly also providing the choreography. It offers a comic depiction of Hollywood, and its transition from silent films to "talkies." Although it was not a big hit when first released, it was accorded its legendary status by contemporary critics. It is now frequently described as one of the best musicals ever made, topping the AFI's 100 Years of Musicals list, and ranking fifth in its updated list of the greatest American films in 2007.